To find our coordinators find the statue of John Wayne on ground level. Cross the street and proceed to the back, left corner of the parking lot (see arrows). You will find the associations drivers and vans. 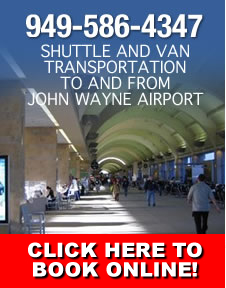 The objective of the John Wayne Airport Shuttle Association is to provide Orange County Airport patrons with high quality shuttle service by employing all Shuttle Drivers based at the Airport. Our coordinators wear orange jackets so they are easy to find. They are trained in airport shuttle customer service. Our field dispatchers are only a step away from you and they are ready to assist you with your transportation needs. The only time you do not need a reservations is when your are at the airport. Then you can simply proceed to the John Wayne Shuttle Association Pickup Area and we will assist you. Please call field dispatch at 949-586-4347.